I’ve been doing a bit more physical activity each week to try and improve my level of fitness since October last year. On the 21st of January a few members of IS along with a few others in council (who will remain nameless) decided to partake in a Biggest Loser competition to help motivate us all to lose a few kilos. The $100 entry fee was a good additional motivator. 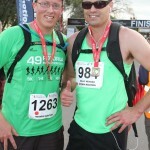 On March 10th I took part in my first half marathon, the Copthorne Off-road Half Marathon. 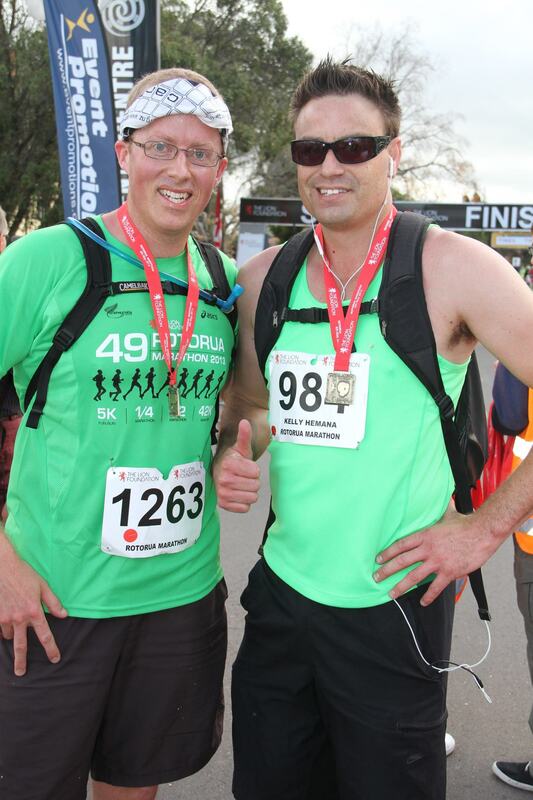 I surprised myself and my friend Allan (who had done a lot of marathons) with a time of 1:52:07. So I had only been doing 5km training runs to improve my short distance pace. 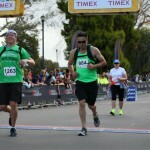 After beating him by a small margin, he joked by saying I should enter the marathon. 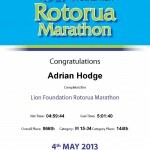 Having completed my first half marathon two months earlier, this seemed like the most natural progression. So with no distance training I nervously entered the full marathon for that coming Saturday (five days before the event). Registering on the Friday afternoon was a painless process, one more sleep to go! Slightly scared and apprehensive about the whole thing. I turned up on the Saturday morning 30mins before the race was to begin. Lots of nervous people lining up to use the bathrooms in the EEC. 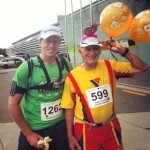 I bumped into this old fella who had these 50th balloons, I thought he was a bit premature knowing that the 50th was next year, but it turned out to be his 50th marathon. He said he ran his first marathon when he was 53, He finished 3/5 out of the over 80 male division. Well impressed! 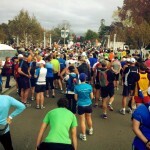 The first 25km felt fine, may have had too much water prior to the start as I needed to stop to pee twice. It was definitely a physical battle, certainly from the lower half. My lungs and heart coped fine but my legs didn’t want to cooperate. I ended up walking a lot of the final 13km from the Whakatane turn-off. Luckily I was going around with this guy I know, Kelly Hemana from OGO. So together we helped keep each other honest, and at the 40km mark we checked the time and thought we might be able to get in under 5hrs. We dug deep and jogged through the pain for the final 2.2km. I was stoked to have come in with a mat time of 4:59:44! Two days later I was still hobbling around, my achilles tendons were tight and I could only just start lifting my legs without the assistance of my arms! 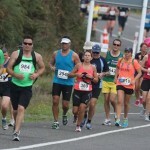 Next year’s the 50th Rotorua Marathon, I’ll be signing up as soon as the registrations open and will be much better prepared, both mentally and physically. With some decent training and lead-up I hope to come in under 4hrs! I’d like to thank Kylie Lang from Event & Venues for the complementary entry. My running progress on my RunKeeper profile. We have two weeks of the biggest loser competition left and It’s come down to a two horse race between me and another worthy competitor. Watch this space! My first, his 50th marathon! GSX-R1000 Crash, worst finish to best MotoTT trackday ever! Today I attended a MotoTT motorcycle trackday in Taupo. It was a special trackday as they were drawing the grand prize winner of the 2012 Suzuki SV650S (valued at $13,500). 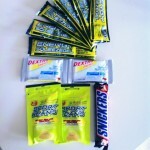 To have an entry in the draw you needed to have attended two trackdays since August 2011. At lunchtime they pulled my name out of a bag of over 200 entries, “it was easily the best, most valuable thing I had ever won in my life, I was on cloud 9 and it happily came on the second anniversary of my first ever trackday back in May, 2010″. Continue reading GSX-R1000 Crash, worst finish to best MotoTT trackday ever! In the last weekend of January before Joshua started school, we borrowed a friends ute and all his camping gear and took the family on our first ever camping trip. Considering we hadn’t spent a single night in a tent together, Kim and I were a bit apprehensive about the whole thing, but thought since a lot of our friends with kids were camping, it seemed like the ‘in thing’ to do. Not wanting to let the Jones get one up on us we packed our friends gear and headed on our way! We did our research on camping grounds/holiday parks and were initially shocked at the cost per night for our family. Around $70 per night (2 adults & 2 children) for a piece of unpowered land! But looking around various holiday parks in the Bay of Plenty, we quickly came to the realisation that this was a rational charge during the high season, which we unfortunately were going to be falling into. We decided on the Ohope Beach TOP 10 Holiday Park which came highly recommended to us by friends who had spent time there recently. The facilities were a major draw card for us; an outdoor pool with two slides and a kiddies pool, a childrens playground and even mini golf! While the mini golf course was a little tired and needing a freshen up, it was a great holiday park and we will certainly be returning there one day once we have our own camping gear. I took plenty of photos and videos on my iPhone and put together this short holiday video using the iMovie app on my iPad so we can relive our first family camping trip for many years to come. Now, it wasn’t heavy enough to settle or hang around for long, but we can safely say it snowed. And lucky for me I took my camera to work in anticipation of the snow coming and I’m so glad I did! It was to be my third ever trackday at the Taupo Motorsports Park and I was feeling great! It pays to be active on Facebook these days, on Wednesday November 24, 2010 I won 2x PL1 tickets to U2’s second ‘360° Tour’ Auckland show via Vodafone New Zealand’s Facebook page. The tickets had a total retail value of $670.